Our spacious and affordable condo with a hot tub offers nice finishes with flat screen TVs, a wood burning fireplace and is located on the free shuttle route. . The living area is an open space concept with a fully equipped kitchen, dining area, breakfast bar, and cozy living room featuring the wood burning stone fireplace. There are two bedrooms, featuring queen-sized beds and a master suite with a king-sized bed. There is a one-car garage and washer and dryer in the unit. Our condo is 1 mile from Big Sky Town Center and just a short 10 minute drive to the biggest (and best) downhill skiing in the west. Big Sky Resort is "America’s Biggest Skiing," offering winter enthusiasts 5,800 acres, a 4,350 foot vertical drop, and average annual snowfall of 400 inches. Lone Peak, at 11,166 feet, offers challenging runs, iconic chutes, and magic carpets at the base offer kid-friendly beginner runs. 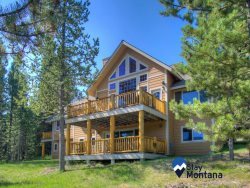 - Outstanding location – 7.2 miles to Big Sky Resort, 10 minute walk to Big Sky Town Center, 52 miles to West Yellowstone Entrance. Nice layout with big kitchen and living room, well furnished, convenient to Big Sky restaurants, good hot tub. Garage to park in was a pleasant surprise. Nice on cold mornings before leaving to ski. Exceeded expectations The condo itself was great. Garage included, so we never had to scrape the car off. Nice kitchen. 5 min to town center and 10 min to the mountain. Very clean and everything worked. The king bed in the master was one of the best beds I've ever slept on. Each bedroom has its own bath. Very nice shower in master bath. Worked great for everyone. The Murphy bed in the second bedroom is on the firm side. Could use a pillow topper. Very nicely furnished. Good communication from property manager. Everything went smoothly. The daily rate for wifi usage is ridiculous, so we used our data plans. My only other gripe would be with the pricing structure. In the end, with the cleaning fee, insurance, and taxes, the effective nightly rate was almost double the advertised rate. That being said, I still plan to stay either at this particular place or something similar again, because it was still a much better deal than any of the hotel or resort properties in the area. Really not much negative to say except that free Wi-fi would have been nice. We paid by following the directions in the folder and it was pricey and not good wi-fi. For some reason, I thought it had a hot tub, but it did not. Loved the art in the condo and the beautifully crafted furniture. The property was very quiet as well. It is only about a 10-15 drive to Big Sky and Moonlight Basin to ski. Well worth the price.